Kleinfeld’s Canada in Toronto, ON will be holding a Paloma Blanca In-Store event this week featuring brand new styles from our Spring 2016 Collection! 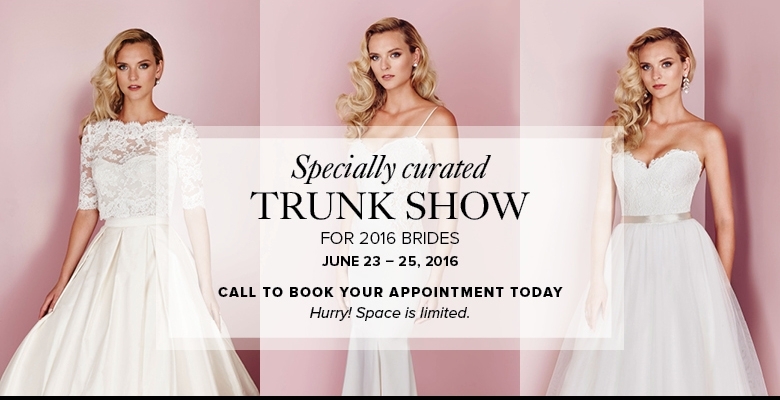 Kleinfeld’s Event will be held June 23rd-25th. Paloma Blanca Style 4665: French Alençon Lace and Paloma Satin Wedding Dress. Sweetheart neckline bodice with spaghetti straps. Illusion tulle inserts at waist and lace appliqués along bodice. Fit and flare satin skirt. Swarovski buttons and loops. Invisible zipper continues up lace back. Chapel Train. Paloma Blanca Style 4667: French Alençon Lace and Silk Dupioni Wedding Dress. Cropped lace top with bateau neckline, ¾ sleeves, and sweetheart neckline on lining. Swarovski buttons and loops on lace top only. Full Dupioni skirt with box pleats and waistband. Side pockets. Invisible zipper. Cathedral Train. Paloma Blanca Style 4668: French Alençon Lace and Tulle Wedding Dress. Sweetheart lace bodice with illusion lace back. Swarovski buttons and loops. Removable Mokuba Ribbon at waist. Full gathered tulle skirt with horsehair detailing at hem. Invisible zipper. Chapel Train.